French liturgical poet of the first half of the twelfth century. He is mentioned as a liturgical poet by Joseph Ḳara in his commentary to Job. He was probably the author of the following five poems: "Yomam 'Enenu," pizmon, in which the poet bewails the condition of the Jews in his time, and expresses a longing for the "holy places"; "Yosheb Ḳedem Ebḥarenu," a pizmon in nine verses; "Omnam 'Awinu u-Pasha'nu," a prayer in twelve verses, with a refrain; "Ye'teru Ḥaberim," a prayer in nine verses; "Tafḳidam Mebaḳḳeshim," a prayer for the Festival of Gedaliah. 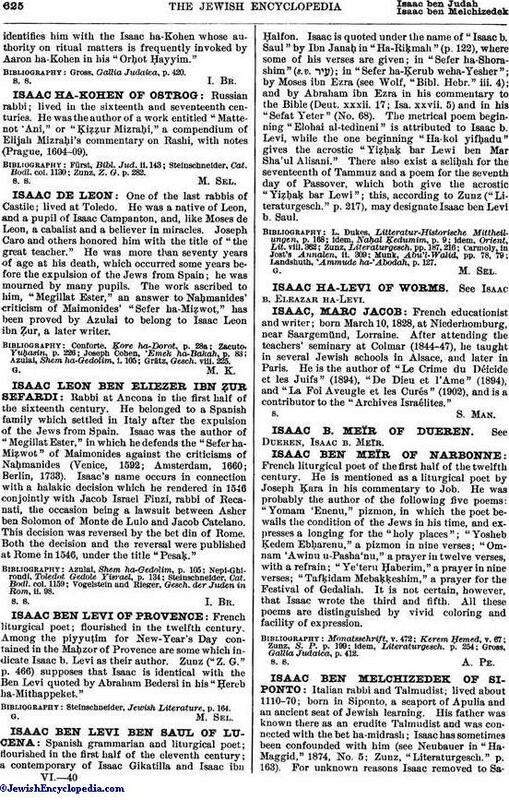 It is not certain, however, that Isaac wrote the third and fifth. All these poems are distinguished by vivid coloring and facility of expression.